A great day of celebration, with the local fans that welcome with great applause, as always, the 22 footballers in the field and all the public present in the stands rushed to cheer on their favorites. The two teams start strong and confront each other openly, but we are not here to analyze the competition but rather to highlight the behavior of the triad that ruins the party and assigns an objectionable victory. To open the festival of dangerous occasions we think of the Rossoneri with the Atalantine who do not stand by and reply without any reverence. The first portion of the game ends with white nets with Milan slightly ahead for non-concrete occasions. In the second half the Rossoneri start concentrated and pass with Bergamaschi but the Rossoneri 7 number is in clear offside and the network is canceled. I report the Atalantina press statement: "At 4 'the very controversial episode that changes the fate of the race. Carissimi kicks from the edge, the ball hits Stracchi that covers his face with his arms adjacent to his body. The referee, despite being in an excellent position, incredibly indicating the spot, leaving the premises stunned. Sabatino makes no mistake and brings the Rossoneri into the lead. " That answer: "At the 11 'Martinovic catches the draw, but he is in an offside position. Bergamaschi at the 13' is warned for the second time for a foul on Jordan and earns the locker room ahead of his time." 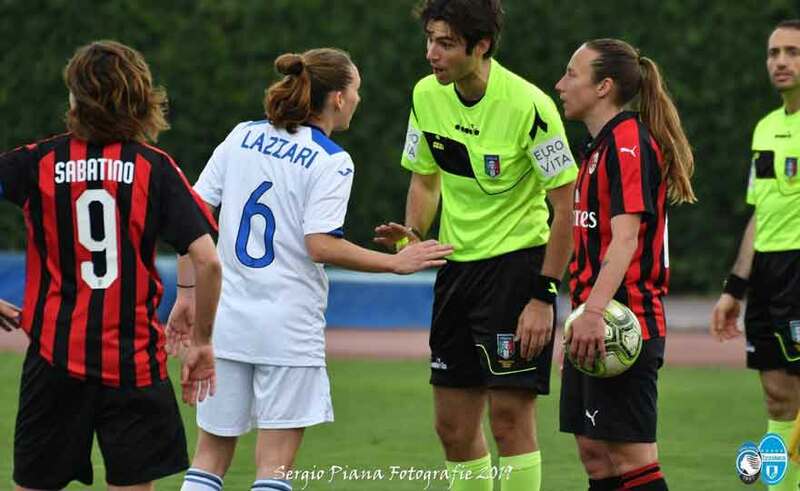 The opportunities for both teams follow one another but it is Milan that tests the 1 Lemey number on several occasions. The 2 at 0 arrives for another error of the refereeing triad: Alborghetti launches Giacinti who receives the ball in a clear offside but the triad is busy looking at something else and leaves the tournament's top scorer to score his 21a goal. A good race, with a disappointing Milan in the game through the usual vertical throws for the champions Sabatino, Giacinti and Bergamaschi and an Atalanta Mozzanica that was opposed with dignity and commitment so as to propose itself dangerously ahead engaging the extreme defender Rossoneri. The Rossonere of Morace take three points given away by the refereeing triad, useful to continue to fight and hope for a place in Champaions, in the absence of which it would be a season to forget. I wonder if these "phenomena" will have the courage to admit their mistakes to repeat the race or whether they will be forced to go against their conscience and confirm their incompetence by assigning the victory to the good Rossoneri.